Rosaleen Moriarty-Simmonds has spent her life championing the cause for disabled people and was recently been presented with the first ever Owain Glyndŵr Seren Award. The awards were created to recognise the unsung heroes of Cardiff who go the extra mile to help others. Rosie was born with missing arms and legs as one of the Thalidomide babies born in the late 1950s early 1960s. In championing the cause for disabled people, Rosie has campaigned at both a local and national level for greater disability legislation. And she has worked closely with the Disability Rights Commission to ensure the Disability Discrimination Act 1995 was recognised as a valid tool for promoting equality for disabled people. 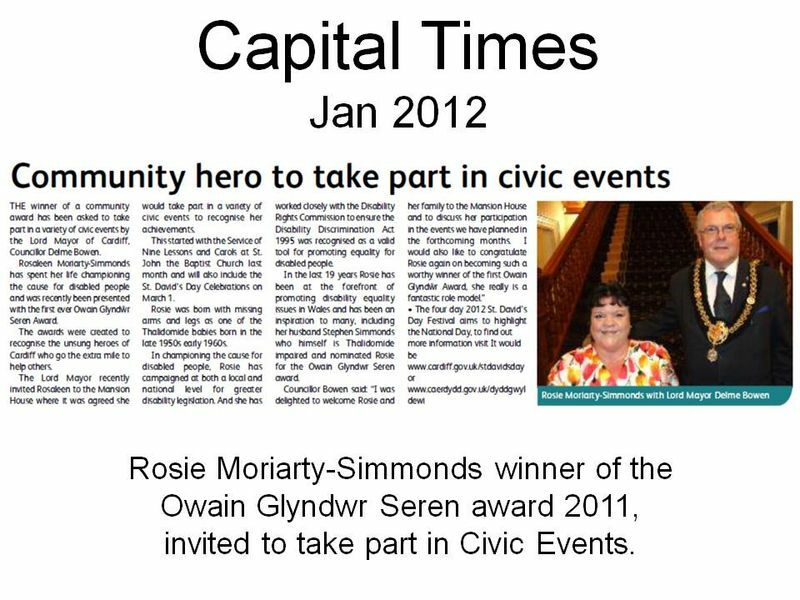 issues in Wales and has been an inspiration to many, including her husband Stephen Simmonds who himself is Thalidomide impaired and nominated Rosie for the Owain Glyndwr Seren Award.